The medium-size Sea Bag is water-resistant and features sturdy, rope handles, a zipper closure, and an additional zipper pocket inside. If you’re traveling for the holidays, it’s the perfect carry along bag for the car. And we love the vintage compass design. The Pendleton Blanket is made of a 100% pure virgin wool, making it equal parts comfortable and long lasting. Much like the Sea Bag, it’s great to have on hand when you’re traveling with kids. The blanket also comes with a handsome leather carrier for easy portability. To enter, comment below. We’d like to hear about your family’s favorite local holiday tradition. Is it a town craft fair? Tree lighting? Quirky event? Give us all the details and you could win this amazing gift (valued at over $250). Winner will be chosen at random. Contest ends Saturday, December 10, 2016 at midnight EST. Best of luck! PS: If you’re shopping www.daytripsociety.com or www.daytripjr.com, use the promo code CUTEPOTATO16 and you’ll get 15% off your order! Discount is valid through Dec. 24, 2016. Our favorite holiday tradition is riding the Polar Express Train to the “North Pole.” Trains and Christmas excitement are a perfect combo for my little ones. We love going to Pineland Farms and making wreaths every year. Which tree farm do you go to? We’re always on the hunt to try someplace new. on December 9, 2016 at 12:57 pm | Reply Sarah B. We loving going to Pineland Farms and making wreaths! We love painting ornaments together that we then give as gifts to our family. We also go to the tree lighting and sing Christmas carols. L.L. Bean! This year they have Christmas trees, northern lights, and a train set up in the Children’s area. Our favorite tradition is to purchase a new ornament each year to symbolize an important event that took place. This year we have two–one for our new home and the other for baby’s first Christmas. Aw, congratulations to you and your family! Heading to Christmas Prelude in Kennenbunk! Sparkle Wknd in Freeport or Prelude in K’Port-it’s a toss up! We’re very fortunate to live in Kennebunk. We kick off every holiday season with Prelude’s Sing-a-long at the Franciscan Monastery. This sounds so lovely. We’ll have to try and get to the sing-a-long next year! We always love going on the Polar Express! We always go to a local tree lighting. We started the tradition when my nephews were born and always enjoy going every year. We go on a holiday trolley ride to see all the lights in our town and then have a pizza party with our friends. We like to go shopping to donate presents to those in need. Tree lighting at Monument Square! On Christmas my while family loves playing the dice game! You wrap a bunch of boxes in one another, normally about five. Then, my family sits is a circle and you roll two dice. If you get doubles, it is your turn to try to unwrap the present but you have to wear oven mitts! Everyone keeps rolling the die until they get doubles and once someone does, it is their turn to try to unwrap the present! This continues until the last box is open. It is very fun and my family gets competitive. The present inside is normally only a $2 scratch ticket but it is everyone’s favorite part of our Christmas party which shows that Christmas really is about spending time with family and not gifts. We love making/ decorating cookies. We do Christmas jammies, too! So much fun. Prelude tree lighting in Kennebunkport is my favorite local tradition. I grew up going every year with my mom. Now I bring my kids. Gets us all in the holiday spirit. Kennebunkport’s Christmas Prelude Tree Lighting with friends!! Our favorite tradition is the search for the tree! We love hiking through the endless woods of Lank tree farm and finding The One. Our kids still manage to only decorate the branch closest to the ornament box but another favorite is going through the ones they’ve made over the years. Our family’s favorite Holiday tradition is to attend the opening of Christmas in Louisville. We go to Christmas on Main Street where the tree is lighted, caroling goes on all over the area, a temporary skating rink opens and the merchants dress in period clothing from the 1800’s. We spend the entire day walking the area. Sometime we get to dress like its Fall, but this year we are going to have to dress warm. It’s freezing! Merry Christmas! Merry Christmas to you! We can’t wait to visit Louisville one day (we have family nearby in Bardstown). We are so fortunate to live in such an idyllic area with so many wonderful things to do throughout the holiday season, but I must say singing Christmas carols with the monks at the monestary has got to be a favorite. It reminds me of my childhood, going door to door singing carols in our neighborhood. Just warms my heart! We love seeing the Norton Lights in Wells each year! While we’re not exactly local, we love to come up to the Christmas prelude in Kennebunkport and to the festivities in Ogunquit for the tree lighting in Perkins Cove. Love seeing Nubble Light all lite up and the lobster trap trees!! Our favorite tradition is taking our children to see the Nutcracker in Portland! This is our first holiday season in Kennebunk the tree lighting in Dock Square was truly the most magical holiday moment I’ve had. My boys, husband, and I all loved it. Can’t believe this is home! we drive around as a family the week before Christmas looking at all the lights! Shopping and seeing the decorations in Kennebunkport. This is my first time in 16 years not being home for Prelude since I moved after college. I miss how magical it is. Definitely candlelight Christmas Caroling at the Franciscan Monastery in Kennebunk. Prelude is simply beautiful ! Candy Cane making at Havens! 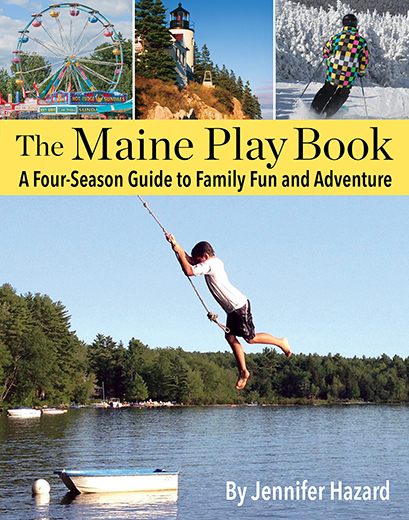 Fun holiday tradition for the family and the best part is that all proceeds benefit The Dream Factory of Maine. We went to the Candy Cane event for the first time this year, and had so much fun! Every year my sister and I drive down to Concord, MA to do our Christmas shopping, rather than going to the mall or buying everything online. There’s so much history in Concord center, making it the perfect place to to stroll and shop. We always stop in at the same little bakery off the Main Street for a coffee and croissant. We’ll have to check Concord out… sounds beautiful! Every night in December leading up to Christmas, we light a candle and read a Christmas story by the light of the Christmas tree before bedtime. We also love to ice skate at Mill Creek Pond! Each year we do our best to set up the tent in the living room and make the kids favorite dinner, burgers and fries, and watch the Polar Express. With HOT Chocolate of course! Then the kids get to sleep in the tent and have a “camp out”. We like making Christmas mice – shortbread mice with almond slices for ears, licorice shoestrings for tails, and wee chocolate chips for eyes and nose. We love catching the tree lighting + fireworks in KPT! Our local holiday tradition is lobster rolls at Old Salts and then watch Santa come in on the lobster bust during prelude. Our Christmas morning also has its regular tradition of waking up and toasting the day with mimosas while the kids tackle the stocking. We take a present break and have sticky buns and apple caffluti (both only made for Christmas) and crack open the Christmas crackers. We love making Ocean themed salt dough ornaments every year, and giving them to family and friends. The kids also love when we make gingerbread men. Everyone gets their own icing, and we let our creativity run wild! Love ugly sweater parties with my boyfriend! For our family the most important holiday tradition is lighting the advent wreath each night at dinner and slowly reading our way through a summary of the Old Testament (kid friendly) working our way towards Christmas! As my family is all out of town, my favorite tradition is with my girlfriends. Every Prelude weekend, I meet a couple of them downtown for the tree lighting, and then the following day is spent craft fairing with a few others, from sun up to sun down. I feel very blessed to have such good friends and live in a town with a beautiful holiday celebration.